The City of Davis is in the process of developing a bike and pedestrian plan to help people navigate the pathways and bikeways. Have you ever said to yourself on a pathway or bikeway: "Where am I?" or "Which way am I facing/ going?" The goal of this project is to improve navigation and experience of the pathways and bikeways for Davis residents and visitors. Share photos of signs and other navigation tools you use to get around Davis. Add your photos to our Google drive. Share photos of signs and other navigation tools you use to get around new places. Attend our workshops: October 19, 2016, January 18, 2017 and June 7, 2017. Give us your feedback for Workshop II by filling out our survey. The project team was at the Davis Farmers' market from 4:30- 7:00 p.m. finding out how Farmers' Market visitors navigate around Davis and other places. We heard that most people use Google Maps and other electronic mapping tools to navigate. What is wayfinding and who is our audience? Below are the meeting materials from the first workshop on October 19, 2016. We interviewed people in Davis to better understand how they get around and their navigational needs. The people we interviewed used different methods to find their way. Exercise 1: Personas- how people navigate further explored the similarities and differences in how new residents, visitors, commuters to Davis, longtime residents, and families navigate Davis. We asked- Which common wayfinding strategy do you use most? Overwhelmingly maps (18) and signs (16) received the most votes. Asking people (2) and compassing (3) were the least popular. Using landmarks (11) and following bike and walking path markers (10) to get around were also common wayfinding strategies. 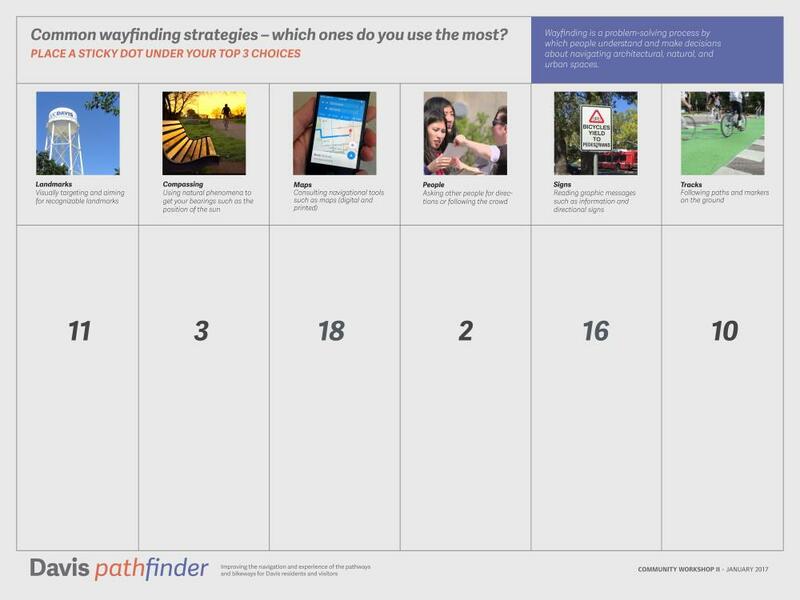 We asked- Participants to rank the common wayfinding strategies in order of importance. Most people agreed that orientation signage, directional signage, and identification signage were the most important types of bike and pedestrian wayfinding signage. The etiquette signs ranked high and are important for new Davis residents and international students. After our first public meeting community members continued to provide us with feedback on our website: Below is a summary of what we heard. The loop is great for navigating. I would like to see other major corridors identified in some manner. Wayfinding signs should direct people to key points. Major bike paths should have signs to say which direction is north, south, east, and west. The highest priority should be naming the pathways and adding pathway name signs. A sign on B Street that says this way to Yolo Library is a much lower priority. All bike path tunnels that cross underneath a street should have the name of the street above the tunnel entrance. The easiest places to get lost are the bike paths. We need signs directing us from the street to the pathways. Place signs saying 15 minutes to downtown. I would like more obvious marking of the through routes. There are three routes from Putah Creek trail to downtown and none of them are marked. Below are the meeting materials from the second workshop on January 18, 2017. Wayfinding hubs- which ones better aid navigation? Time versus distance- which one do you prefer?